Below is a summary of our course offerings. Please click on any course name and you will be taken to the page where you can learn more about the course, view all available classes, and register on-line. Prices include HST. There are no refunds or make up classes for not attending. Group classes have between 4-12 dogs. We are conveniently located for classes in the Metro Toronto area on Yonge Street. Detailed maps and instructions are available here. PART OF THE PROCEEDS FROM ALL COURSES ARE DONATED TO CHARITY. Click on any class title to be taken directly to the page containing class times and locations. 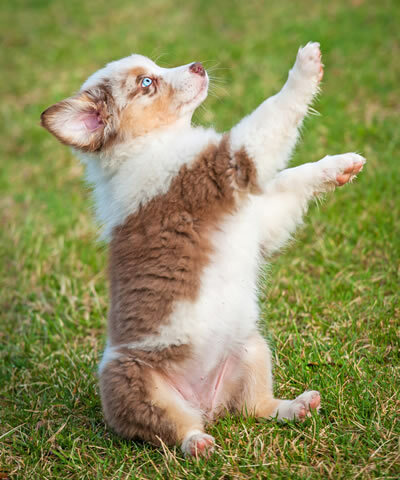 Puppy programs are designed for dogs who have received their second set of shots. Using a positive approach, we focus on training for the pet and companion dog with the emphasis on relable responses. You will learn to teach your dog to come when call, to follow from a distance, fetch, hide and seek, sit, down, and stand. Plus all of those normal natural "doggie behaviours"... barking, chewing, jumping up, biting or mouthing, and house soiling can be discussed. Course length is five weeks (one session per week). Price $175 (+HST). Your dog will learn to present good manners at home, in public places, and in the presence of other dogs. A certificate from the Canadian Kennel Club will be presented upon completion. Course length is eight weeks, including the test (one session per week). Price $260 (+HST). Does your dog race outside with ears plugged to the sound of your voice, sniff every blade of grass, lick every pool of liquid and pay far too much attention to objectionable objects? Sounds like he may be due for a slight outdoor tune-up. Who says you can’t teach an old dog new tricks? Our Trick Training classes are open to dogs of all ages and are an excellent way to build a stronger relationship with your canine. Is your dog full of energy, has a hunger to run and loves to jump high? Or perhaps your dog just wants to have fun and you don't have the space in your backyard to set up a course. Come and join us in these 8 week courses for Bounder to weave, leap, jump over bars, crawl through tunnels and have fun. This is a great class for you and your dog to reinforce teamwork and for you to learn how to give direction and guidance using positive reinforcement. There are three levels. Each class consists of 8 weekly sessions.